Friday night’s SuiteSports Game of the Week was a thriller right down to the end. A game filled with dramatic plays, lots of penalties, and a second half downpour, the Rams and Mountaineers sure gave us one to remember. 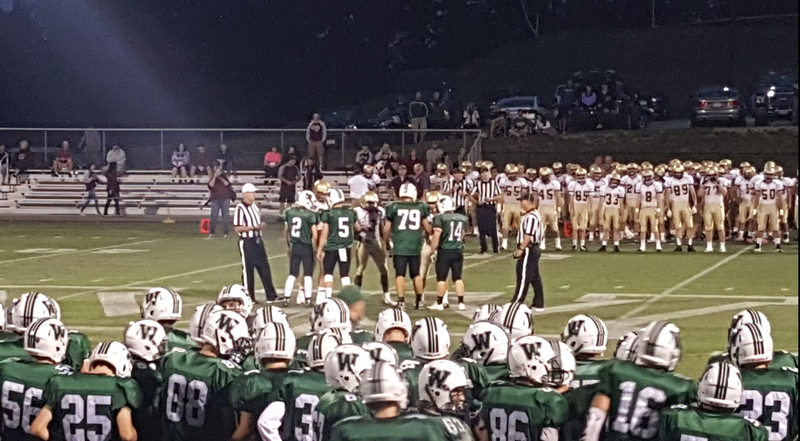 But, in the end, it was Wachusett (3-0, 1-0 Mid-Wach A) sealing the deal with a 28-21 victory over Shepherd Hill (0-3, 0-2 Mid-Wach A). Let's take a look back at this thrilling Mountaineer win. Surprise! Shepherd Hill running back Kevin Mensah was cleared to play just hours before kickoff. He had been sidelined for the first two games of the season by the MIAA, and his return lit a fire under Shepherd Hill’s offense in the first half. The Rams seemed to have no trouble moving the ball down the field, both on the ground and in the air. The Mountaineers did all they could to keep pace with their fast scoring opponents, by setting up long, methodical drives resulting in touchdowns. By halftime, the Rams had three touchdowns (two rushing touchdowns by Mensah, and one by quarterback Ryan Wong-Li), matched by the three Mountaineer scores (two on the ground from running back Josh Furtado, and one passing score from Mike Fiorelli to Barry Walsh). During halftime, the sky opened up. The weather change was about as drastic as the football play too. The offenses that couldn’t be contained in the first half were now quieted, leaving the third quarter scoreless. Both teams remained tied at 21, as they had been going into intermission. Two minutes into the fourth, however, Wachusett would break through. Josh Furtado would find the end zone for the third time of the evening for the Mountaineers. The Rams would get a few more drives in before the clock would expire, and even looked like they may have the game-tying score on their hands. Late in the game, Wong-Li sent a ball deep to an open Kevin Mensah on fourth and nine. However, a great show of hustle by Dan Turgeon would seal the deal in this one, as he closed the gap between himself and Mensah, dove, and broke up the pass. 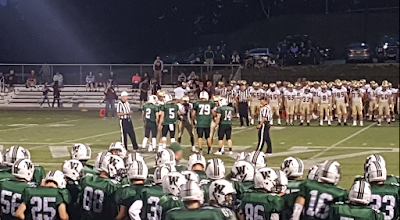 Wachusett would prevail at the end of this contest, pushing its record to 3-0, and knocking the Rams to 0-3. After the game, I caught up with Josh Furtado from Wachusett. The Mountaineers needed more than one stop, and they got them. Furtado had a fumble recovery in the second half that was a momentum shift in the game, and coupling that with Turgeon’s late game heroics, the Wachusett defense made the plays it needed to in order to secure the win. Coach Dubzinski also talked about the implications this win had for the Mountaineers, who now go on the road for three of their next four games. Wachusett isn’t looking at the schedule past next week, and it shows in the work ethic of the team. Next game up. All eyes are now set on their game at Doherty next week. It’s no secret that Shepherd Hill is now in a very tough spot. 0-3 is not how anyone thought the Rams would start. That being said, the only way they can go is up. Today was the first step in the right direction. The Rams offense was as explosive as any team’s has been all season in the first half. Now, maybe it was the rain, maybe it was the defensive adjustments by Wachusett, or maybe it was just running out of steam, but that dynamic scoring attack vanished after halftime. I caught up with Kevin Mensah after the game to see how he felt. Aside from being thrilled to be back on the field, he was very hopeful for Shepherd Hill’s future. He’s absolutely right. Shepherd Hill has been at least competitive, if not dominant in the first half of each of its contests this season. Now the Rams just need to close. Mensah seems confident that his team will get there, quite soon. In addition, Mensah’s presence on the field itself is huge for this Rams squad. Kevin spoke a bit about the turn of events that allowed him to be out there for his team tonight. It’s definitely good to see this kid back on the field. There was a palpable new swagger on the Rams sideline tonight with Mensah active. Although a playoff berth will be hard to secure at this point, the Rams are poised to make a push to the finish. The only way I see Shepherd Hill moving, after tonight, is up.